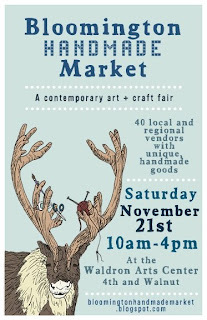 A friend of mine, Nicole, and two other women have been planning a market for handmade goods this coming Saturday at a local arts center here in Bloomington, Indiana. I thought I'd apply for a table space, and got accepted, so I've been making some smaller (and inexpensive) pieces for it. Most of the items for sale will be holders for incense sticks. The less time consuming format lets me have a go at different wood and inlay combinations, or finishes and carving styles. 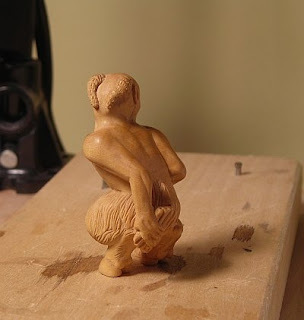 I'll have some of my figural carvings there too. If you live in central Indiana, please come and have a look. It'll be a fun event. This small netsuke is carved out of mountain mahogany wood- a piece from an assortment sent to me by Brad Blakely, a carver. The subject is one that I've learned crosses many cultures. Fox fire is defined as "A phosphorescent glow, especially that produced by certain fungi found on rotting wood," but in times past it was thought foxes had something to do with it. In Japan, it's known as kitsunebi. 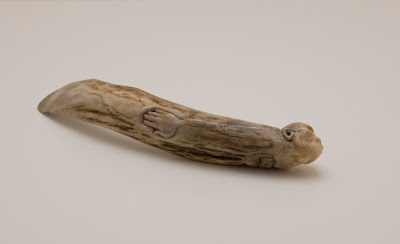 The removable ivory peg represents the flame cradled in a curled tail, and serves as the netsuke himotoshi. It's been a while since I've posted new work. I had a bout of writer's block (carver's stump?) for a few months where nothing I started seemed to please me, and the grass outside needed mowing, etc. etc. So, pushing excuses aside, I've been back to work the past few weeks. I'm not sure of the title for this piece yet- maybe just 'Metamorphosis'. I had a piece of antler who's tip always spoke 'I'm a fin' and recently, the idea congealed to create a grotesque human form emerging from it. Jeffrey Klotz of Takara Asian Art sent me a questionnaire recently asking about my history as a carver, and thoughts and comments about my work. He's giving a workshop at the upcoming NYC INS Convention about contemporary netsuke from the point of view of contemporary carvers. If you're going to the convention, I urge you to drop in on Jeffrey's seminar. 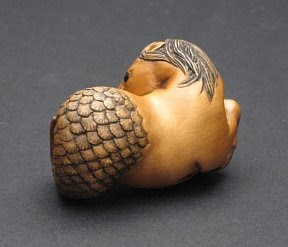 He works hard at promoting the work of contemporary netsuke-shi. I think it's important for collectors to understand the motivations and goals of the artists themselves. People are free to interpret art as they choose- that's the beauty of it- but I think it aids in collecting if we try to see things from the artist's perspective (maybe the reason for this blog site?) From my point of view, glimpses into another artist's head are invaluable for my own development. comments you think might help collectors to better understand you or your work. I tend to not place too much emphasis on symbolism or artistic statement in my works. 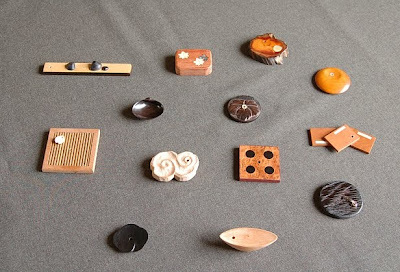 They are what they literally are- small carvings. I try to create something that will bring beauty and enjoyment to people's lives; not an overt expression of ego or aspiration. 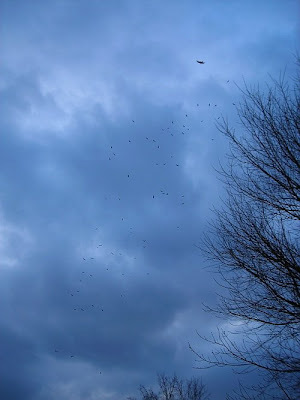 I'm learning to not get caught up with the minutiae of a subject, but to look for its essence instead. Most of all, I enjoy the process of improvement, exploration and development. I've learned to not be in a rush, but to do good work, attempt improvement and enjoy the ride! 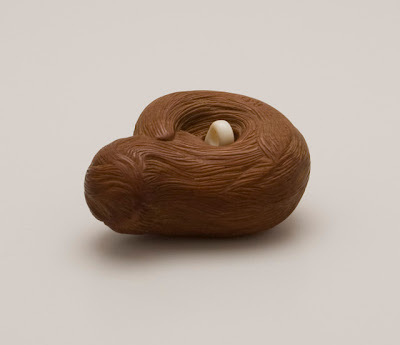 Do you do much planning when you are going to carve a netsuke? Yes, I create a number of sketches normally to find a pleasing composition or posture in a piece. I'll have an image in my mind that's perfect in its intangible way. Sketching begins the process of educating your hands and eyes what the mind already knows. I collect a number of reference images if it's a subject I'm not too familiar with. 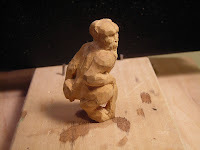 I'll sometimes create a rough clay model, or even a casual carving to understand the form better before starting in fully. Where do your ideas come from? All around- walks, books, dreams, television. Do your inspirations come from your heart and/or your mind? I suppose. I don't think there's much difference between the two for an artist. Do you have a set schedule for when you carve? No- whenever I can find the time. Where do you carve? - Describe the room. A spare bedroom. It has my reference books in a bookcase, a small CD player, my carving benches, tools, boxes and small cabinets of wood and other raw materials. The lighting could be much better though. 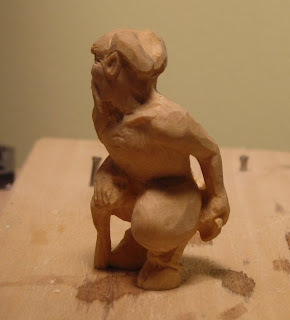 I'll clean things up before each new carving, then it gets messy again as the carving goes on. I work seated on the floor. I have a feeling that I have much less gear than some other people. It's easy to get caught in the tool trap. It doesn't take much to create good work. Do you feel removed from the rest of the world when you carve? Sure! 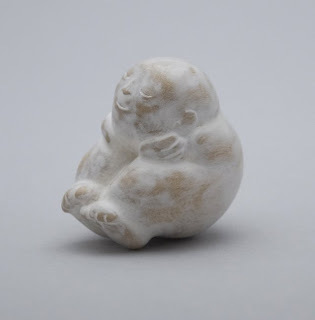 When you are designing a piece, do you keep in mind traditional constraints on netsuke that would allow them to be worn and to be practical for use? Yes, I have this in mind always. Whether or not I am successful always is another question! I think some people misunderstand the art form and create very baroque pieces. There's a current in contemporary carving to create wedding cakes and wax figures. 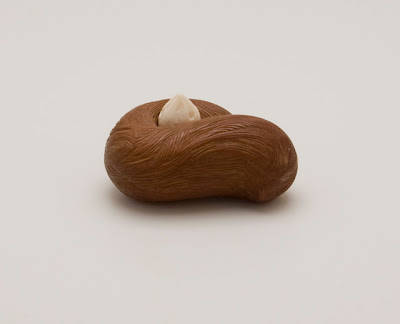 How did you become interested in netsuke? I studied art in college at the School of the Museum of Fine Arts, Boston. The collections in the museum were viewed almost daily, and I became interested in the decorative art and craft of Japan, especially netsuke. I also had a Japanese professor at the time and many fellow Japanese students as friends, so I learned a lot about the culture of Japan from them. 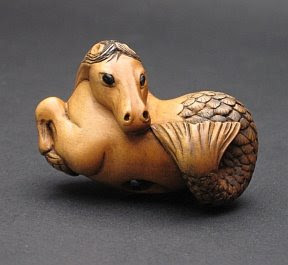 How did you decide to become a netsuke carver? 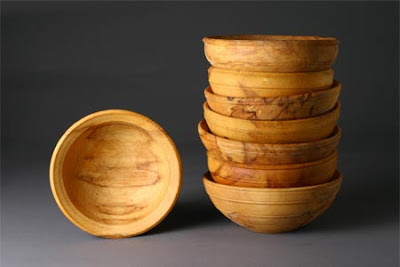 I was unemployed for a period in 2000 and bought a piece of boxwood and a couple of tools and started as a way to pass the time. I was hooked instantly. 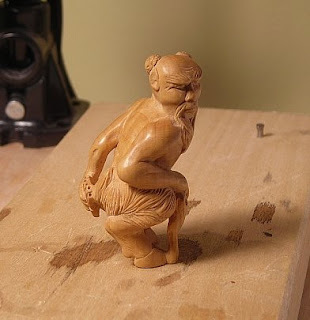 How has your style changed since you first started carving netsuke? 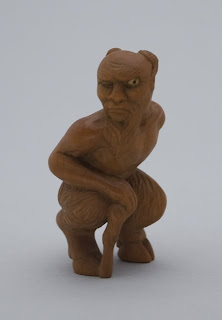 It may seem ironic, but I've carved fewer and fewer things of an overtly Japanese theme as I understand the netsuke art form and Japanese decorative art more and more. I try to take on less complexity in thematic, decorative, technical terms with newer carvings, instead focusing on toolwork, quality of finish, design… the basic formal elements that make a decent work of art. The Japanese-ness is internalized (I hope) rather than overt. I think a lot of artists go through phases of getting back to basics- I'm doing that right now. Where do you see yourself going with your carving? Wherever it will take me- I'm still a beginner! I'll strive to create more straightforward, confident, direct carvings that can stand alone without explanation. There's a directness that comes with experience and a real understanding of what beauty and creation is. 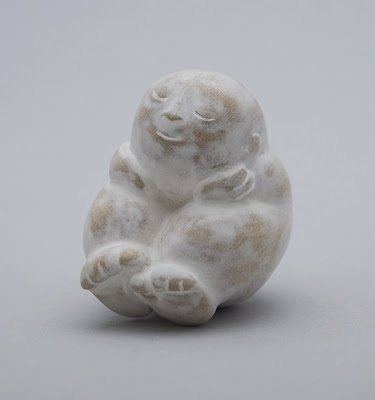 I'd like to strip away fussiness and the trap some carvers get into with piling on preciousness…that's not netsuke: its jewelry. There's a point in creation where the object severs the umbilical cord and breathes unaided by the creator. It's wonderful when it happens. The piece is clearly made by so-and-so, but now it walks on its own two feet. 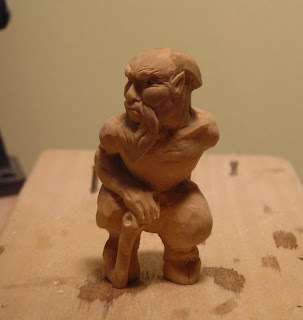 Who was your main carving or netsuke carving teacher? Self-study, life. I wonder if you can really learn much from someone, aside from technical tips? If you're clever and resourceful and keep at it you'll get most of it on your own. It might take a bit longer, but I think the knowledge is more solid. 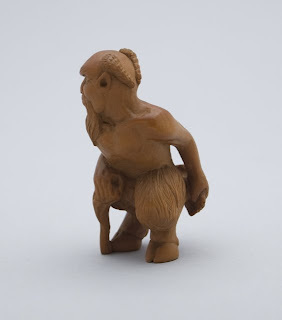 Who were your other carving or netsuke carving teachers? Though I haven't learned from anyone directly in person, I've been influenced by seeing the work of others in museums, or through photographs. Bishu and Masatoshi's works where I could find them were an influence when I began along with Janel Jacobson. Her online presence helped me a lot in understanding the discipline I would need to create real works of art- in the sense of seeing her own development, visible skill, marketing, etc. She personally encouraged me too, from the start. I'm really influenced now by So School carvers. There are some good online forums with certain artists who are honest with criticism and encouragement, and open with sharing tips. I appreciate a good dialog. It's a shame I cannot meet with these people for a few beers each month and just hash out ideas. I'd be a better artist for it. Which of your teachers has influenced you most and how have your teachers influenced you? The carvers whose works I look at help inspire me by setting the bar high and help me discern elements I like and dislike. By looking at enough work, we begin to sort out what is important to us as an artist, personally. If you see enough work, you begin to get a wide enough vocabulary that you're no longer copying and coming up with pastiche, but really creating something honest, within its own moment. Being a good student is tough, but being a good teacher might be even harder. Those teachers I haven't mentioned- thank you! Have you been influenced by carvers from the past? Sure. Particularly those represented in the MFA collection. Who or what else has influenced you? I look at a lot of other craft forms- ceramics and basketry right now, but also other types of wood carving, textile arts, musical instrument making, prints and drawings. I'm a bit grumpy over the state of contemporary art and what has become known as 'studio craft' so I steer clear of that. Too much glitz! 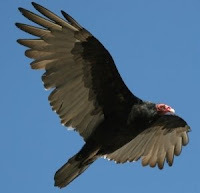 I read a bit of poetry and wonder if I can find a way to incorporate the poet's vision into my work. Are you carving for yourself or your audience? Myself mostly. Peers, a little bit- I think they're my audience. How do you feel about selling your pieces? I don't mind. For a number of years after I began carving people would say 'you've really got to try to sell that piece' or 'you could get X dollars for that', but it took me a while to be assured personally that I was doing even remotely good work, before I took someone's money for it. It wasn't a matter of confidence in my work-though I've been dissatisfied with a carving, I think I'm right where I should be. I just didn't want to put something out there until it met my standards. I still have a tough time with selling (not the parting with, but the taking cash). There's so much junk being created today, by artists full of ego (I'm talking about the larger art and craft world), who get personal gratification from their art based around if they're selling and for how much. The artwork hasn't changed if it sells for $500 or $5000. Its spirit and quality is the same. I don't rely on sales as a major source of income, so perhaps I don't have the same financial pressures as some other carvers. I'd just as soon not deal with the business end of things- promotion, pricing, commissions, correspondence, etc. 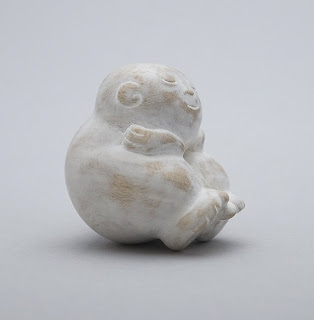 How does interaction with other netsuke artists and netsuke collectors affect you and your work? I don't really have much contact with people who have purchased my pieces (through dealers, or online)…it's probably better that way (wink)! Truthfully, a lot of collectors/dealers are boastful, uneducated, and boorish in their demeanor. I think we'd all like our pieces to go to people who have saved their pennies and find an intimate connection with our art. I've found a couple of those too! I've enjoyed every moment I've had with other carvers. We're a fun bunch of eccentrics. I learn a lot, not necessarily in terms of skills, but by the examples they've set as people. How has being a carver changed your life? It has taught me the value of discipline and stick-to-it-ness. I've met some great people through this endeavor. I've had my eyes opened to other cultures and times. I finished this one about a month ago, and it's the first photo of work using my new camera, which I think is giving me much better results than past efforts. 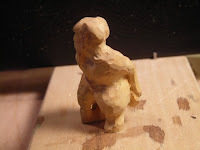 The figure was inspired by a statue I saw last summer in Japan on the grounds of Nanzen-ji. It's carved out of holly, with a coating of gofun paint. It's not a very detailed work, or labor intensive even- I was inspired to be fairly direct with the expression, and to experiment a bit with surface treatment to develop the theme further. It measures about 1 3/4 inches. 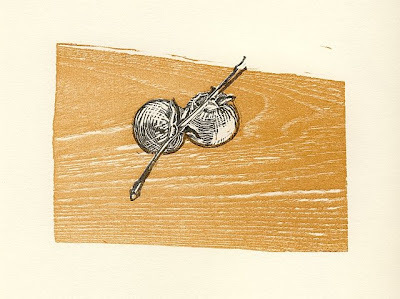 Last weekend, here in Bloomington, I attended a wood engraving workshop taught by Gaylord Schanilec. Gaylord gave a talk the night before at Indiana University's Lilly Library about his personal history as an artist and printer. He's recently completed Sylvae; a catalogue and guide to the 24 species of trees on his Wisconsin property. The theme of trees and printing their grain was to come up in the workshop later. With it being a two-day introduction and the fact that I haven't done this sort of printmaking before, I didn't get too ambitious in subject matter or complexity. Gaylord has found that endgrain blocks of hard maple work just as well, if not better, for his purposes as the more traditional boxwood, so that's what was used for my print. The background block was printed from elm, if I'm remembering correctly. I learned a bit about the marks which different gravers make as well as how to operate a Vandercook proo fing press. It's been a long time since I've done artwork in two dimensions, especially this sort of thing where what you create on the block isn't directly related to what you get as a final result. 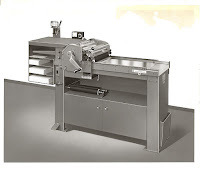 The image is reversed, of course, but also with wood engraving if you want to create a black line, you've got to cut it twice- once on each side. The tendency is for beginners to create white-line images, on black backgrounds because it's much easier to conceive. 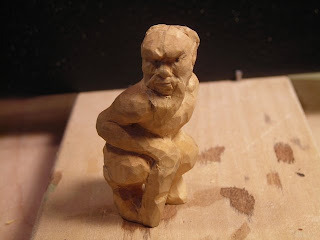 At one point I realized I was carving the block instead of engraving it, so if I want to delve further into this art form, my mind's got to separate the three-dimensional instincts of miniature carving and its tool use, from those of two dimensions. I have some boxwood in my store that isn't idea for carving, so I might cut out some type-high blocks, order some gravers and get cutting.